Many children hope to find jelly beans, marshmallow Peeps, and chocolate eggs hidden at the bottom of their Easter baskets. These sweet treats are often sugary and sticky, contributing to tooth decay. 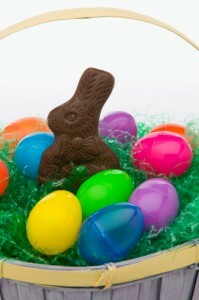 Instead of promoting cavities this Easter, Dr. Young offers a few ideas to create healthy Easter baskets. Small toys: Try stuffing your baskets with stickers, erasers, bouncy balls, play-dough, silly string, crayons, stuffed animals, coins, and other small prizes. Be cautious of tiny objects that could cause a choking hazard to young children. Outdoor fun: Encourage your children to enjoy the spring weather with new outdoor activities. Consider filling baskets with sidewalk chalk, jump ropes, skates, sports equipment, flower seeds, and other recreational hobbies. Don’t forget to include a mouthguard to prevent facial injuries! Healthy snacks: Instead of feeding your children candy, you could stuff eggs and baskets with fruit, nuts, pretzels, popcorn, sugarfree gum, and other healthy, edible goodies. Just make sure your children brush after snacking. Skin health: Summer is coming up, and you want to make sure your children are staying healthy outside. To coordinate with their new outdoor toys listed above, be sure to encourage your child to use sunscreen and lip balm to prevent dry skin and chapped lips. Additionally, pack in a small water bottle to promote hydration and to keep moisture in the mouth. Dental products: Don’t let the candy-filled holiday cause you to neglect proper dental health. Toothbrushes, toothpaste, dental floss, and mouthwash are all available in travel-sized packages for easy egg-stuffing. Don’t forget to throw in a gift certificate to Dr. Young’s office! If you indulge in Easter sweet treats this weekend, be sure to practice proper oral hygiene and visit Dr. Young to protect your teeth from decay and gum disease. Contact our family dentist office in Lafayette at (337) 237-6453 to schedule an appointment.